The Chase is probably in all fairness one of the least popular Dalek stories in the entire history of Doctor Who. Often lambasted for its more comedic elements, The Chase is nevertheless one of the most important stories in the history of the show as it really helps to expand on the characters of the Daleks. The Daleks plot revenge against the Doctor for foiling their invasion of earth. They create a time machine, bigger on the inside than the outside that can travel to any planet at any point in its history. This machine which they call the “DARDIS” is able to track the TARDIS throughout all of time and space wherever it goes. The Daleks first pursue the Doctor, Ian, Barbara and Vicki to the planet Aridius where the Daleks force the native life forms, many of whom they slaughter, the Aridians to help them try and capture The Doctor and friends. The Doctor Ian, Barbara and Vicki manage to escape however, but the Daleks follow them. The first place they escape to is the Empire State building which the Doctor quickly leaves so as to avoid innocent people being hurt in the crossfire. The next place they arrive at is the Mary Celeste where the Daleks cause all of the passengers to flee the boat and thus become responsible for the famous mystery. The Daleks and the Doctor next arrive in a seemingly haunted house where they battle Dracula, Frankenstein and a Ghost lady. It later turns out that this is merely an amusement park with the Dracula, Frankenstein and Ghost simply being life size robot replica’s. Unfortunately in his haste the Doctor accidentally leaves Vicki behind. Vicki manages to stow away on board the Daleks time machine however where she discovers their plan to build a life size replica of the Doctor whose job is to infiltrate and kill the team. The two time machines next land on the planet Mechanus, a jungle planet which is seemingly uninhabited except for by hostile vegetation. The Daleks robot very nearly infiltrates the team, but fortunately Vicki is able to warn them in time and the Doctor is able to destroy it. The Daleks however soon corner the four time travellers in a cave, but they are rescued at the last moment by a mysterious robot, a Mechanoid. The Mechanoid takes The Doctor, Ian, Barbara and Vicki to its city above the jungle where it locks them in a cell with a young astronaut named Steven Taylor. Steven explains that humanity built several cities on many different worlds with service robots, the Mechanoids, but unfortunately before anyone could inhabit these colonies earth became involved in an interplanetary war. The Mechanoids were programmed to obey only a select group of colonists who never arrived due to the war. Anyone who isn’t one of the colonists they imprison. The Daleks soon make their way into the city and declare war on the Mechanoids for in their minds harboring the time travellers. The Daleks and the Mechanoids who are armed with flame throwers battle it out. Whilst the they are fighting the Doctor, Steven, Ian, Vicki and Barbara escape into the jungle below, though the Doctor leaves a bomb first, which completely destroys the city eliminating both the Daleks and the Mechanoids. The Doctor then uses the Daleks time machine to get Ian and Barbara home to their own time after which on the Doctors instructions they destroy the machine. The Doctor and Vicki using the time space visualizer are able to make sure that they are able to get home safely. Though the Doctor is saddened to see them go he is happy that they made it home and departs with Vicki and Steven, whom he is unaware has stowed away on board the TARDIS, having assumed that he perished earlier. Dalek/ To defy Daleks is death. Dalek/ Advance and Attack, Attack and Destroy, Destroy and Rejoice! Barbara/ We’re not idiots! We want to go home! Ian/ Yes! Home! I want to sit in a pub and drink a pint of beer again! I want to walk in a park, and watch a cricket match. And above all, I want to belong somewhere, and do something! Instead of this aimless drifting around in space! The Doctor/ AIMLESS?! I tried for two years to get you both home! Ian/ Well you haven’t been successful, have you? The Chase is sadly in all fairness probably the worst Dalek story not just of the Hartnell era, but of the entire 1960s. Its hard to know where to begin listing the faults with this adventure. To start with this marks one of the only times they tried to inject humour into the Daleks, which is something that should never be attempted. The Daleks are at their best when they are taken seriously. I don’t think its a good idea to ever inject overt humour into something like Doctor Who. Doctor Who is a very over the top, larger than life idea, and I think in order for it to work it needs to be taken seriously. If you draw attention to how silly it is then it all just falls apart and seems like a parody of Doctor Who rather than Doctor Who. Sadly that’s what The Chase feels like. We have Daleks stumbling over their words, behaving like morons, and worst of all getting beaten up by fun fair robots. Episode 4 of the Chase is one of the worst single episodes of Doctor Who ever made. It completely undermines the Daleks credibility as villains. I mean really how the hell are fun fair robots able to beat them up? 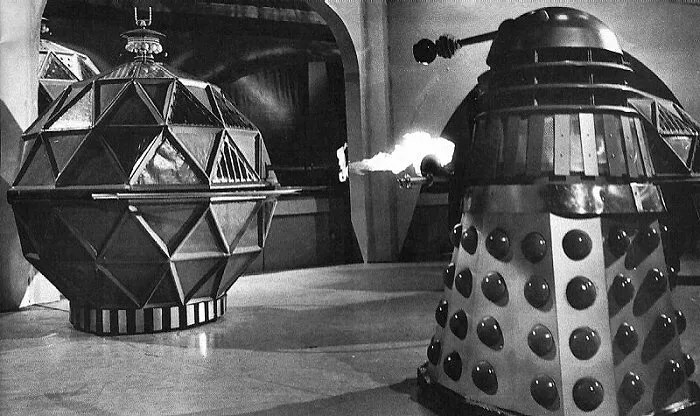 One wonders why we never used those robots one of whom ripped a Dalek in half during the Dalek invasion of earth? The Chase is also very shoddily made too. There are many glaring mistakes throughout it too. For instance there is one scene where an old Dalek prop has been left behind and is visible in the background whilst Ian and The Doctor are talking. The Daleks at that point have not meant to have arrived! Then there is also the scene where Barbara misses her cues when she is supposed to stumble into a trap. Worst of all however is the way the Doctor’s double is handled. Its one thing to have a scene where there are two versions of the same character side by side and for it to look a bit naff, such as in “Star Trek” where there are the two versions of Captain Kirk, and we can see the line down the screen. In The Chase however for some reason when we see the Doctors double on his own you can still tell its a fake. Why they didn’t use Hartnell for these scenes I don’t know, but they dub his voice over the robot double and it looks terrible. Still despite its many shortcomings The Chase still manages to not only entertain, but actually be a very important story overall in the history of Doctor Who. That’s the great thing about the 60s Dalek stories, because the monsters are so fresh at this point, then every story brings something new to them. The Chase to start with introduces the idea of the Daleks and the Doctor actually having a feud with one another. Prior to this the Daleks had no idea who the Doctor was. Indeed the Daleks were just monsters that the Doctor ran into from time to time. Here however we see the Daleks now actually know who he is and take the fight to him. This marks a total shift in their interactions with one another and really paves the way for later stories that focus on their feud with one another such as “Dalek”. At the same time this story also introduces the idea of the Daleks having the ability to time travel as well. This again will go onto become a very important plot point in later stories and in the new series as well. Ironically even though this story does undermine their menace somewhat at the same time it also unquestionably makes them the Doctors main enemies, as it shows how they unlike the other monsters he has fought know who he is and can even beat him at his own game. The Daleks time machine works far more efficiently than the Doctors and in quite a nice irony, its the Daleks time machine that manages to do what the Doctor failed to do many times and get Ian and Barbara home. Its not hard to see why they didn’t catch on as their design, though unique was very cumbersome and would have been even more difficult to use than the Daleks. 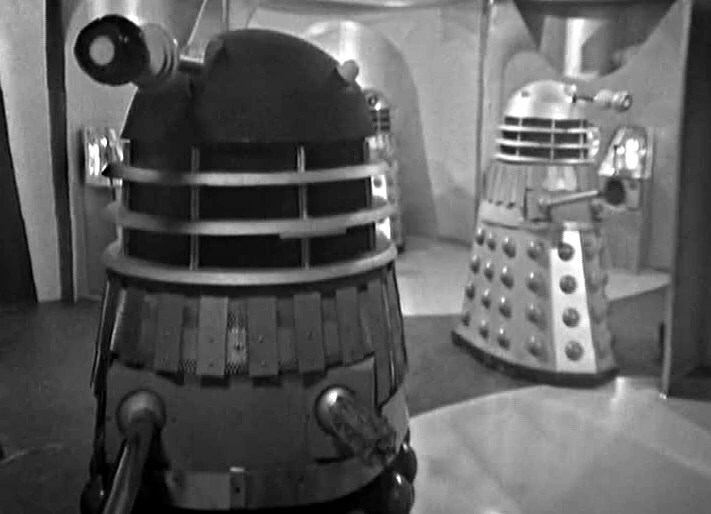 Still the idea of giving the Daleks other mechanical foes who could be a match for them is a truly inspired idea and one which would again pop up in future Dalek stories such as with the Movellans. Thus whilst the Chase may have its flaws, its simply too important a story in the development of the Daleks to completely flat out dismiss. Another highlight of the Chase is Ian and Barbara’s departure. Now their goodbye is not quite as moving as Susan’s, but its still very sad nonetheless to see them go and William Hartnell once again is on top form. He is able to show a softer, more affectionate side to his version of the Doctor in the way he doesn’t want Ian and Barbara to leave. We don’t believe for a second the Doctor’s warnings about using the Dalek time machine being too dangerous. We all know that he just simply doesn’t want Ian and Barbara to leave as he has grown too attached to them, but he is too proud to admit it. In the end though he does the right thing, and its only after they go that he admits how he feels when he says quietly “I shall miss them”. Its nice to see how far the Doctor’s relationship with Ian and Barbara has come since the first story where the Doctor was almost happy to leave Barbara to die! The departure of Ian and Barbara also I think marks another turning point in the shows history as it see’s the Doctor unquestionably become the main character. Prior to this the Doctor had obviously been the title character, but the show was really more of an ensemble piece with Ian and Barbara if anything taking on the more heroic roles in certain stories. Overall whilst the Chase has not aged well its still an enjoyable romp nonetheless and a very important story in the history of the characters of both the Daleks and the Doctor himself. The Daleks time machine is called the “DARDIS”, though it is never referred to as such on screen. The Beatles were originally to have appeared in this story. The band were fans of Doctor Who and were to have originally appeared in a sequence that would depict them as old men. Their manager Brian Epstein vetoed this however. Considering the fates that were to befall both John Lennon and George Harrison this was for the best. A clip of the Beatles performing “Ticket to Ride” still appears in the episode and is ironically the only surviving footage from that performance. This was the third Dalek story in Doctor Who, but it was the fourth appearance of the monsters as they had previously made a cameo in “The Space Museum” the preceding story.